Ames, Iowa — A multidisciplinary team of scientists led by Antonio Mallarino, professor of agronomy at Iowa State University, has completed two years of a long-term field study to better understand the impacts of cover crops on nutrient loss with surface runoff. Cover crops are a recognized nutrient management practice outlined in the Iowa Nutrient Reduction Strategy. They have proven their effectiveness in reducing the amount of nitrogen lost to subsurface drainage, and soil loss from erosion. However, the impact of cover crops in reducing phosphorus loss has not been sufficiently studied. “The conventional wisdom is since cover crops reduce soil loss from fields, they should also reduce sediment-bound phosphorus loss. But there is little information in the literature from the north-central region of the United States. 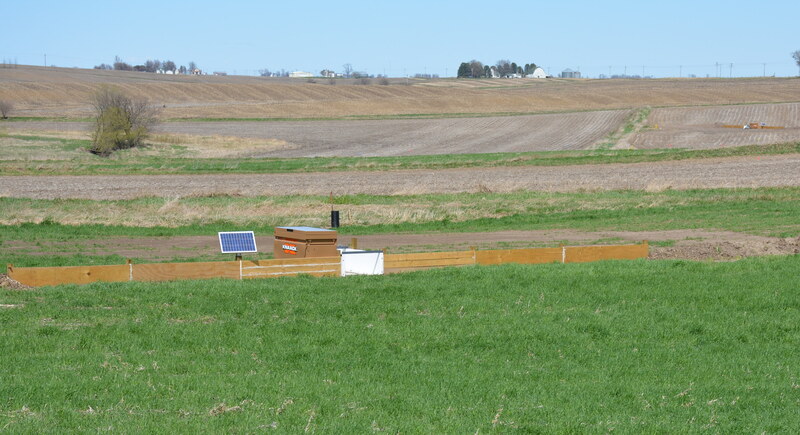 Our study is the first field-scale study on the effects of cover crops on phosphorus loss with runoff in Iowa, and we are studying nitrogen loss also,” Mallarino said. He said when the Iowa Nutrient Reduction Strategy was drafted, cover crop impacts on reducing phosphorus loss was based on a few estimates from rainfall simulation studies. Mallarino’s research team developed the on-going study at Iowa State’s Hermann Farm located south of Ames. The study is conducted on 12 areas ranging from one to three acres in a field that tested very high in soil phosphorus and is managed with a corn and soybean rotation. The research areas evaluate tillage and no tillage with and without a winter cereal rye cover crop seeded each year. Runoff from the test areas is analyzed for total solids and several forms of phosphorus and nitrogen. Their first two years of data yielded some results which Mallarino expected, but others in his field might find unexpected. Dissolved phosphorus is responsible for algae blooms and has a visible impact on aquatic ecosystems. However, Mallarino cautions against drawing conclusions from only two years of data. 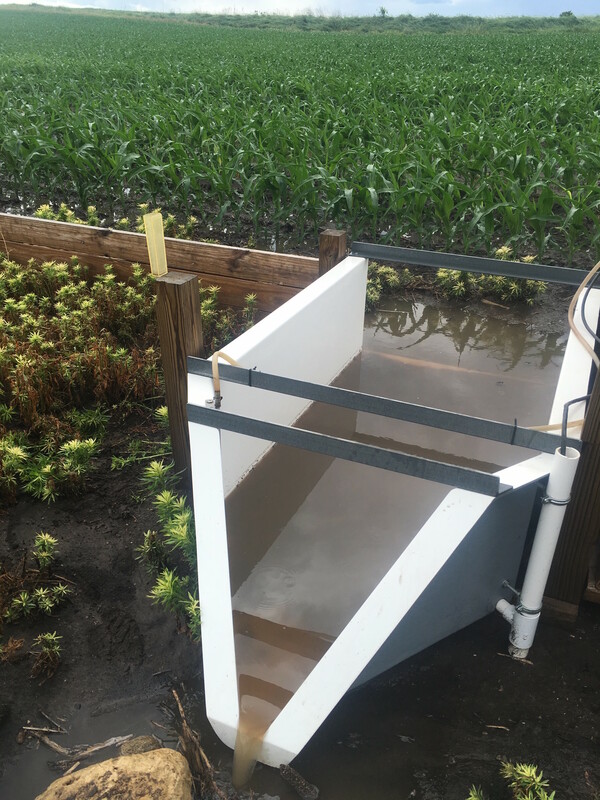 Environmental factors play a role in nutrient dynamics with surface runoff, and during the two years of the study, major rain events at the test site had been minimal with very low runoff. “We can’t make a strong conclusion from these two years of data. There needs to additional data collection from this site and better science-based projecting so we can encourage the addition of cover crops for the right reasons,” Mallarino said. The other scientists on Mallarino’s team include Matthew Helmers, professor of agricultural and biosystems engineering; Richard Cruse and John Sawyer, professors of agronomy; and Daniel Jaynes, soil scientist with the National Laboratory for Agriculture and the Environment. The Hermann farm site south of Ames allowed Mallarino's team to observe the effects of cover crops on phosphorus in the runoff study funded by the Iowa Nutrient Research Center. Surface runoff at the testing site is evaluated for total solids and several forms of nutrients.